Communist Party of India (Marxist) (CPI (M)) leader Sitaram Yechury on Wednesday said that India, instead of democracy, is turning into a mobocracy. His remarks came in the light of a man was thrashed and his house set ablaze by a mob after a cow carcas was reportedly found after his house in Jharkhand's Giridh earlier today. "This is exactly what the country is been brought down to. It is mobocracy, not a democracy. These sort of private armies are ruling the roost because of the patronage that is being provided and the encouragement given to these groups to take law into their own hands," Yechury told ANI. Linking the incident with the upcoming presidential election, Yechury said that it is the basic fight between the candidates in the poll. "On the one hand, we are standing who want to protect them to further strengthen our Constitutional Republic. On the other hand, is the other candidate sponsored by the ruling party, which wants to further undermine our constitutional order," he said. Voicing similar sentiments, Another CPI (M) leader D. Raja said that such kind of incidents continues to take place in Bharatiya Janata Party-ruled states. "I strongly condemn this incident. This lynching continues to take place in all the BJP-ruled states. The Prime Minister should speak out. He goes to America and speaks on many issues. But what is happening in the BJP-ruled states in India? Lynching mob elements are been unleashed against minorities, Dalits and the Prime Minister has not uttered a word so far. So, it is a condemnable incident," D. Raja told ANI. 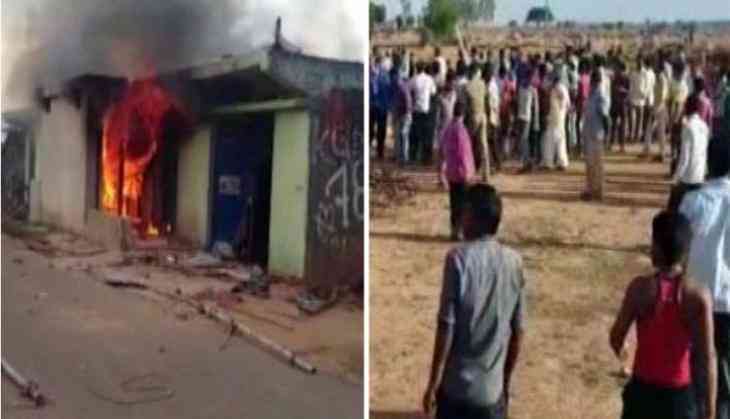 Earlier today, a man of Beria Hatiatand village in Jharkhand's Giridih district was thrashed and a part of his house was set ablaze by a mob after a dead cow was reportedly found outside his house. Usman Ansari was attacked after some villagers found the dead cow outside his house. By the time the police reached the spot, things had become uncontrollable. However, Ansari and his family were rescued and taken to a local hospital. Police had to open fire in the air to disperse the stone pelting crowd.